I haven't posted in awhile, I had a birthday and have been busy... Wow time flies when you're having fun! 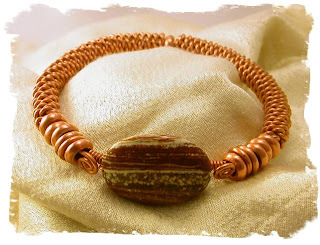 Worked on a new way I think of making a slip on bangle bracelet... it turned out rather nice I think but I have been tweaking with the design to enhance it..
A wonderful surreal Jasper focal bead and hand fashioned copper twisted tubes and copper donut beads. 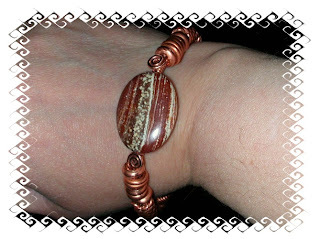 This has no clasp. Slip on!